If the true-life tales of successful, famous individuals like Elvis Presley and Marilyn Monroe have taught us anything, it’s that such celebrities are people like anybody else. They’re not immune to feelings of abandonment and other forms of emotional pain we all experience at different times. 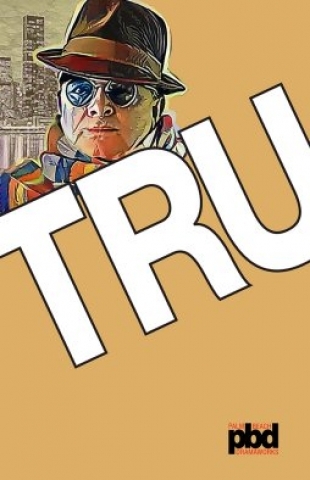 Jay Presson Allen’s historical one-man play, “Tru,” which is on stage through Jan. 1 at Palm Beach Dramaworks in a first-rate production, deftly depicts the humanity and resiliency of late celebrity author Truman Capote. It takes place in the author’s New York City apartment the week before Christmas in 1975. During that year, Capote published an excerpt from his unfinished work “Answered Prayers” in Esquire magazine. It contained rather unflattering comments about characters who closely resembled his wealthy, high society New York friends. The last sentence would have been particularly useful. The people with whom Truman often mingled interpreted the characters to whom the references are directed in the excerpt as allusions to themselves. To express their dismay, they abandoned Capote just as Christmas of 1975 approached, leaving him alone in his apartment. In the play, Capote’s company consists of us, the audience. He shows us some of his prized possessions, boasts, expresses his anger toward those who’ve abandoned him, fondly reads from one of his books and takes us back to his past, which included a rough upbringing. “Tru” suggests that when people are experiencing self-esteem issues or their pride has been hurt, they’ll try to build themselves up. They might do this by bragging and betraying a confident, upbeat, humorous exterior – one that masks the pain and vulnerability they’re experiencing on the inside. Capote often boasts during “Tru,” and actor Rob Donohoe excels at conveying this demeanor without seeming arrogant or otherwise unlikable. 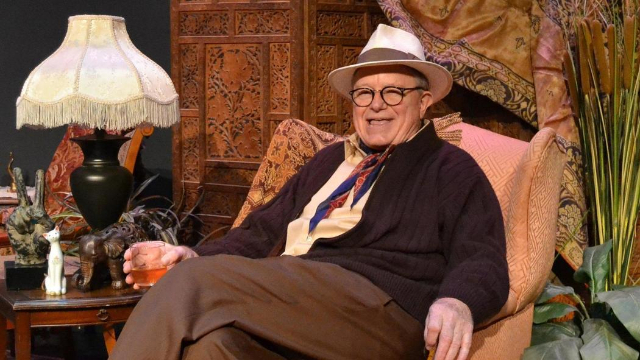 Part of the play’s humor stems from the fact that Capote often brags about himself, but does so in a charming, loveable voice, almost as though he doesn’t know he’s acting conceited. 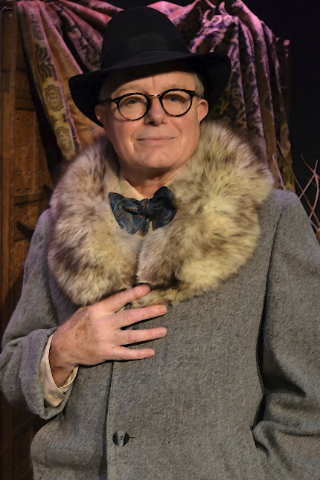 Donohoe disappears into the role, aided by Brian O’Keefe’s costume design, which includes Capote’s signature fedora and sunglasses. Donohoe’s Capote is at turns convincingly loveable, playful, charming, cuddly, sarcastic, angry, frustrated, proud, nervous, wistful and unapologetically boastful. The actor appears to effortlessly capture Capote’s high-pitched voice, flamboyance, southern accent and lisp while speaking clearly and projecting well throughout. Donohoe never tries to mimic the famed author, but captures a sense of his voice. The performance is blessed with nuance, spontaneity and familiarity; you get the sense that Donohoe has internalized his character so deeply that he’s able to speak about Capote’s memories as though they just happened. The actor addresses the audience as though they and Capote are intimate friends. The stage is shaped in a semi-circular pattern and juts out close to the audience, making the connection between audience and performer informal and intimate. Director Lynnette Barkley enlivens the production by moving Donohoe around the stage in an animated manner. The tree, which Capote nevertheless decorates, is one of the furnishings in Capote’s elegant, orderly New York City apartment, designed spaciously and with period detail by scenic and lighting designer Paul Black. Shelves of books, glasses from which to drink and a grand piano add to the luxurious character of the apartment. There’s also a striking backdrop of New York City buildings, letting us know that the play’s set in the Big Apple. Black’s lighting design is appropriately dim during memory scenes that transport Capote back to his youth. Some of the lights are colored blue, which can suggest Capote’s inner melancholy state. Fortunately, you don’t have to be familiar with Capote’s work or even have heard of him to find value in the play. Many people can relate to tales of broken families, the feeling of loneliness and the resultant need to connect with others. Donohoe’s animated performance makes Capote captivating, someone whom we wish to learn more about and read (or re-read) his works. www.palmbeachdramaworks.org or call (561) 514-4042.